Suspended Spiral Stair: R.E.M. 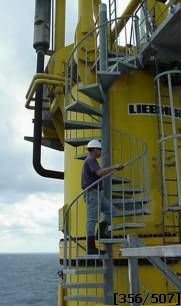 contacted Stairways, Inc. with an uncommon staircase application for a rig. The problem - a crane which rotated 360° at the top and a base pedestal that is stationary. This created more design obstacles like a stationary radii catwalk at the bottom with 36” high guardrail on its perimeter. After getting approval from the crane manufacturer and stating that welding to the pedestal was acceptable, we started the design process. The solution: our spiral stair design involved two heavy I-beams welded to the center column and the crane pedestal…a true cantilever. The center column for this staircase was designed to handle a vertical load and to carry an unsupported load to the bottom. A rigid feat now achieved! The next obstacle was getting the bottom of the spiral stair over the 36" high guardrail. The diameter of the stair was 60”, and the width of the catwalk was 36.” This spiral stair had to rise over 36” in approximately 90° of rotation. Stairways, Inc. designed steps that were safe to walk on and also had the capability to start and stop in a usable rotation. The fact that the staircase was welded made the design changes simple and cost effective. Over the years, Stairways, Inc. has solved many spiral stair problems. Let us turn your next spiral stair problem into a solution. There is no problem too big or too small that we can't handle!